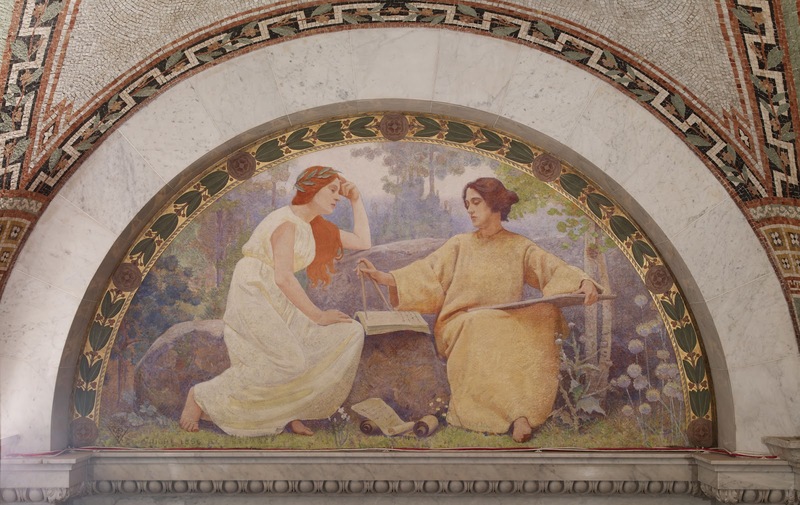 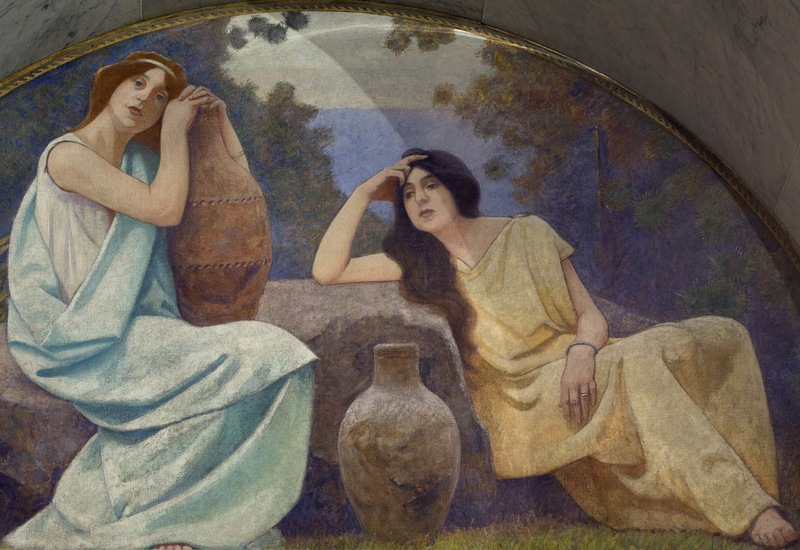 During the mid-nineteenth century, before America had truly established its claim to artistic originality, American artists were seduced by the fascinating Parisian art scene. 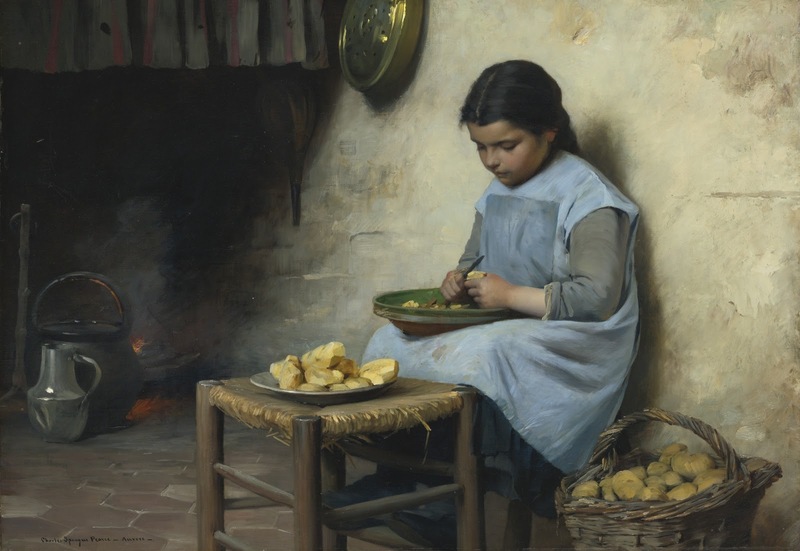 During the latter half of the nineteenth century an important group of American artists congregated in France, among them Mary Cassatt, James Abbot MacNeill Whistler - though only temporarily- and Daniel Ridgway Knight, among many others. 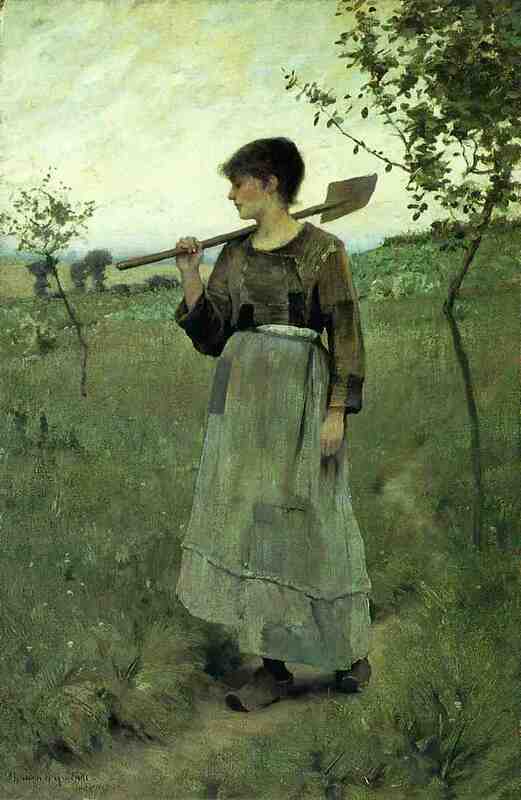 Another American artist, albeit one who has not been given sufficient attention, is Charles Sprague Pearce (October 13, 1851 - May 18, 1914), whose presence in Paris and later Auvers-sur-Oise was important for the propagation and appreciation of American artwork, even though he continued to be strongly influenced by the predominant European artistic styles of the period. 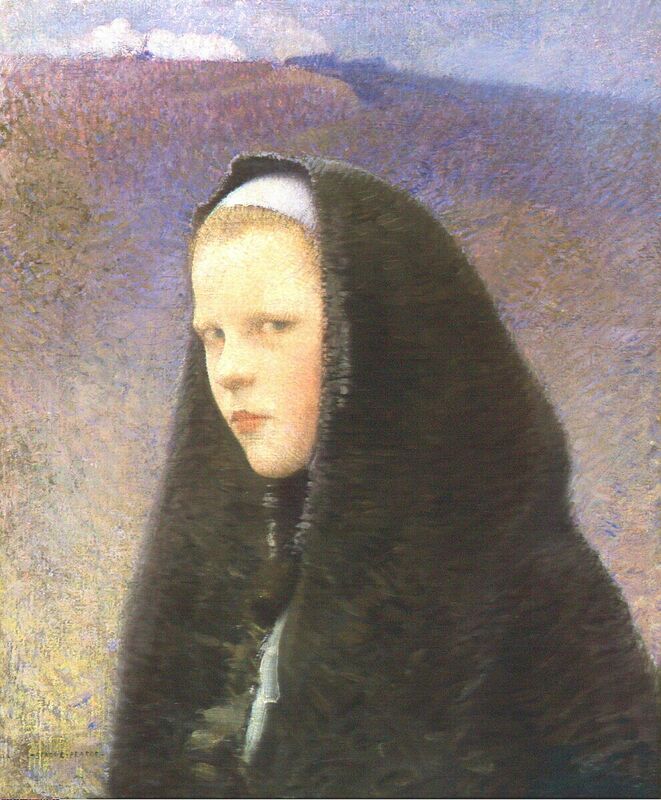 Pearce was one of the most inquisitive and ambitious of the expatriate American painters in Europe in his day, at various times experimenting with realism, neo-grec historicism, Orientalism (both modern and biblical), plein-air naturalism, Japonism, impressionism, symbolism, and pointillism.Pearce’s blend of the exotic and the popular led him to become a sought after artist in both Europe and America, perpetuating the interest in Orientalist aesthetics, among many other preoccupations, as well as the search for newer styles and iconography strongly influenced by what was shown at the public Salon exhibitions. 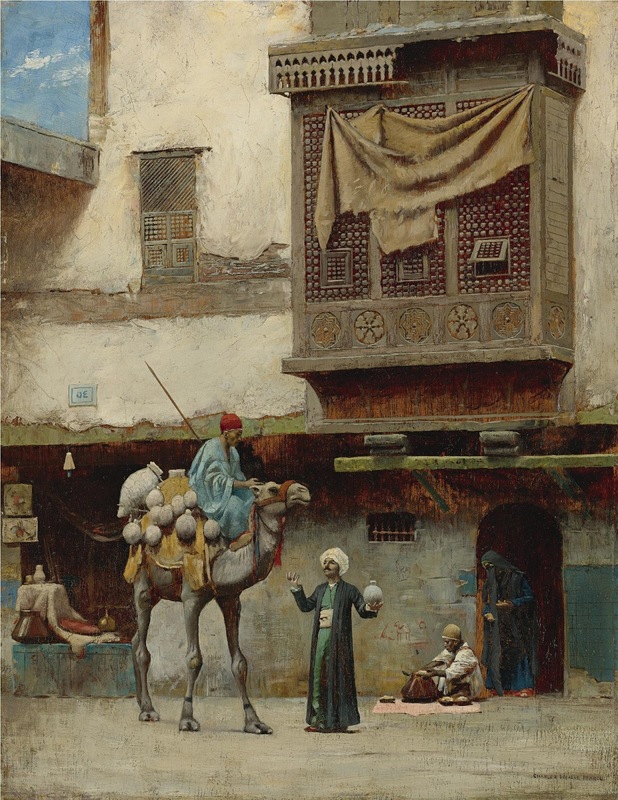 Towards the latter part of the 1873 Pearce and the American Frederic Arthur Bridgman, also from Bonnat’s atelier, left for Egypt and spent three months traveling down the Nile, amassing a wealth of drawings and immersing themselves in a culture that was unfamiliar to their own. This was a spontaneous journey necessitated by the fact that Pearce had contracted consumption; Pearce was traveling in Egypt in an attempt to cure himself with the warmer weather. 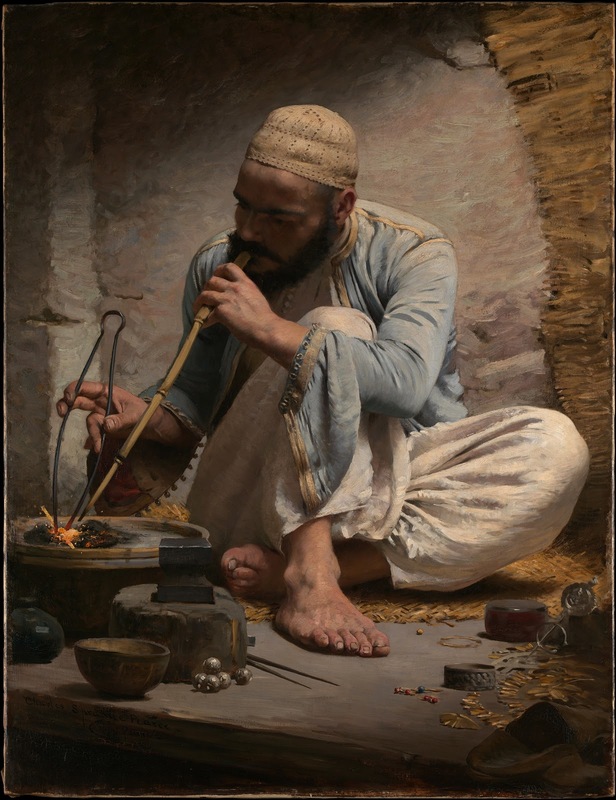 Pearce must also have had other motivations to travel to Egypt, one of them being that the exotic East had been attracting artists and had inspired the use of Orientalist themes in many of the works at the Salon. 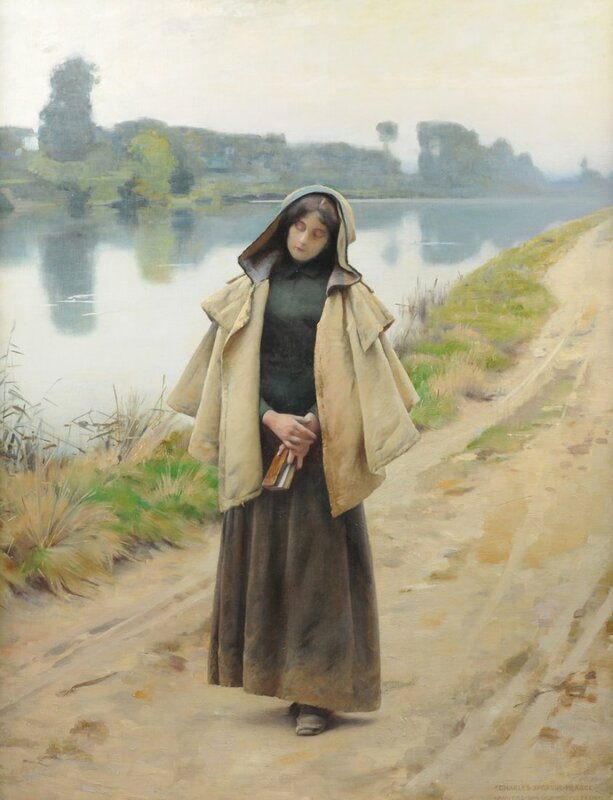 Paintings by Gérôme, Eugène Fromentin and Eugène Delacroix portrayed, in many cases with an almost photographic verisimilitude, revealed the customs, dress, and landscape of Eastern countries. 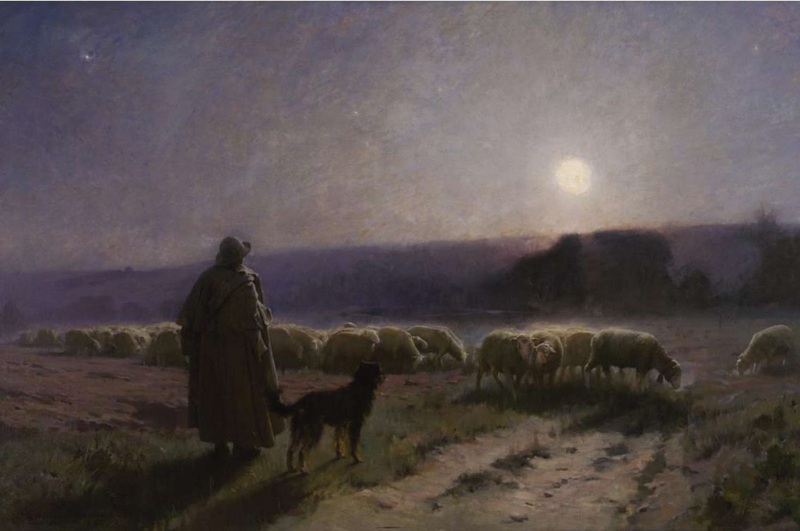 The following year Pearce left Paris once again, this time traveling to Algeria where he spent the winter months absorbing the life and culture of yet another foreign country, further adding to his repertoire of Oriental themes. 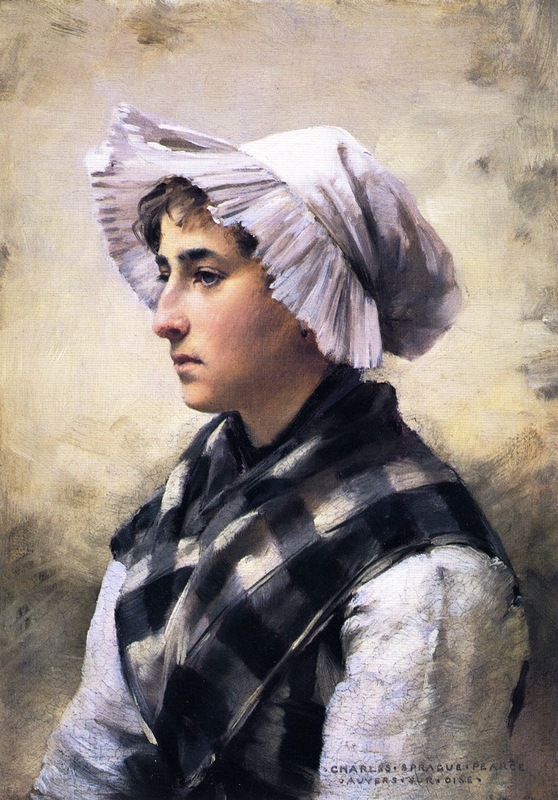 After returning to Paris in 1874, Pearce made his Salon debut in 1876 with a portrait of an American, Miss Ellen Hardin Walworth. 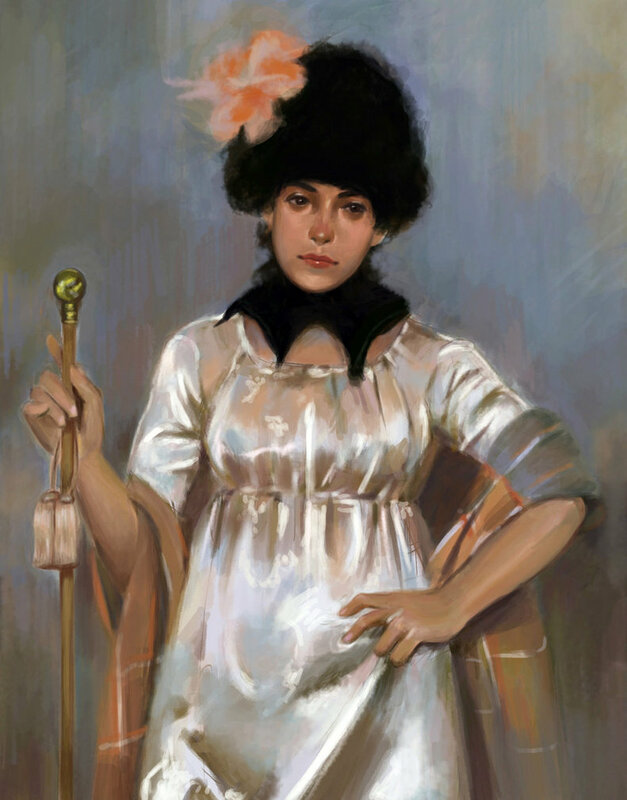 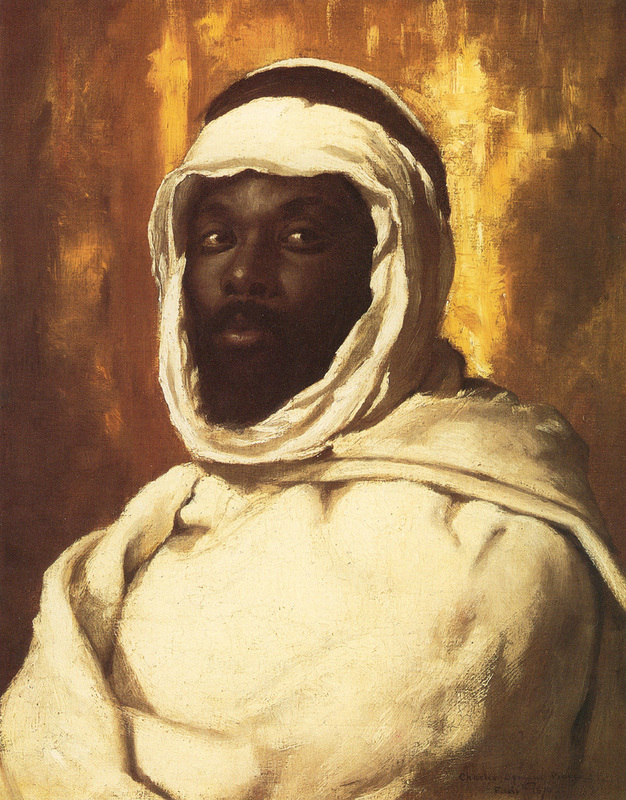 Despite his new experience in Egypt and Algeria, Pearce chose to enter a portrait and not a work inspired by his journeys. 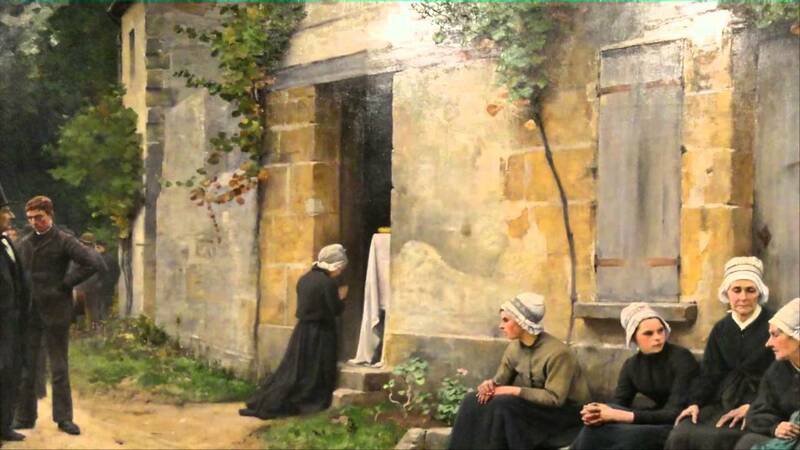 By the next Salon Pearce had turned towards depicting historical scenes, most likely under the influence of Bonnat. 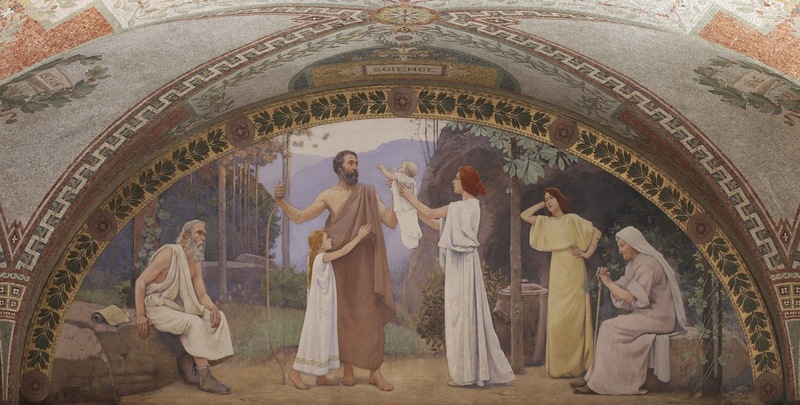 He exhibited La Mort du Premier Né (Death of the First Born) at the Salon of 1877 and integrated eastern details, based on his first hand knowledge, into the composition. 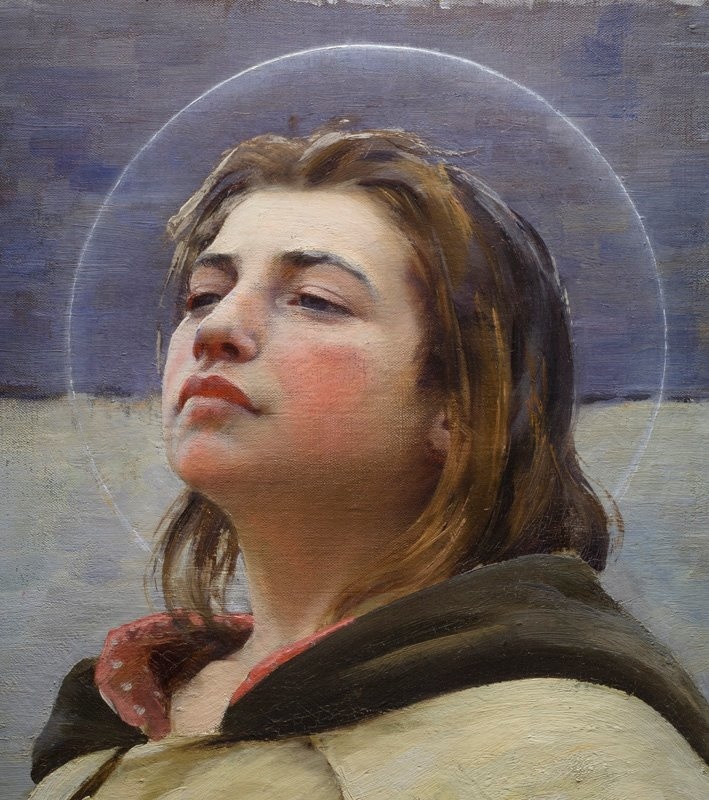 Though no longer an overwhelming popular or progressive subject with many artists, Pearce’s treatment of Biblical history was not surprising as “…from youth Pearce had wanted to be a religious painter of great Biblical subjects”, (Mary Lublin, A Rare Elegance: The Paintings of Charles Sprague Pearce, New York: The Jordan-Volpe Gallery, 1993, pg 11) Vis-à-vis the social and religious preoccupations of the Third Republic, this was fitting since France was zealously religious in an effort to regain religiosity in a period when it was threatened by secular modernity. 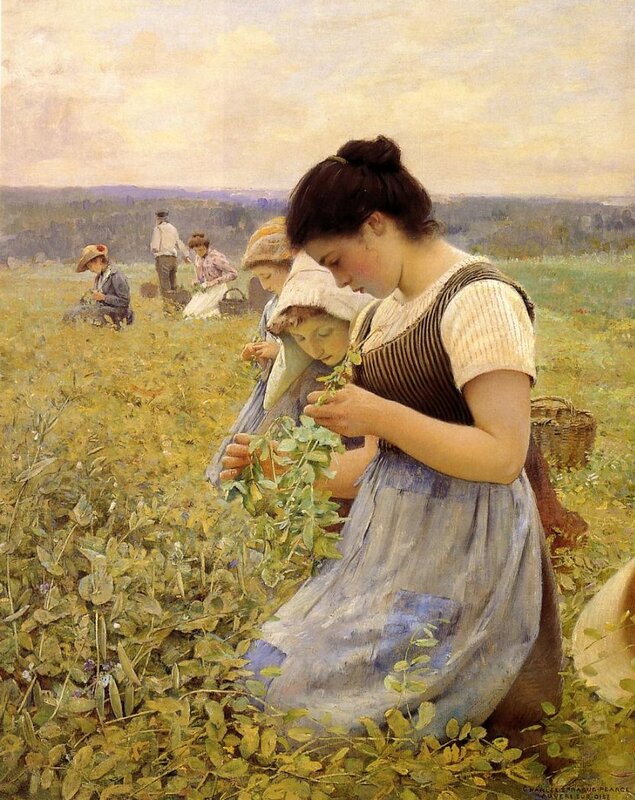 Like many academic painters in an age of archaeological discoveries, Pearce has included artifacts for verisimilitude. 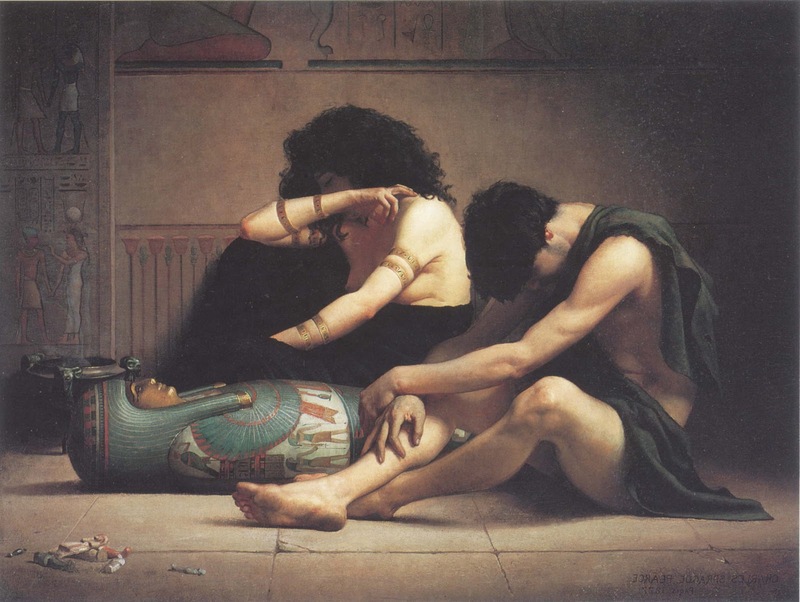 According to an Egyptologist the partial wall painting above the mourners is derived from published illustrations of New Kingdom tomb paintings at Thebes, and the mummy case may be based on one in the Musée du Louvre in Paris… Lamentations nonetheless established Pearce’s reputation as a serious artist and was exhibited in New York City, Boston, Philadelphia and Chicago. 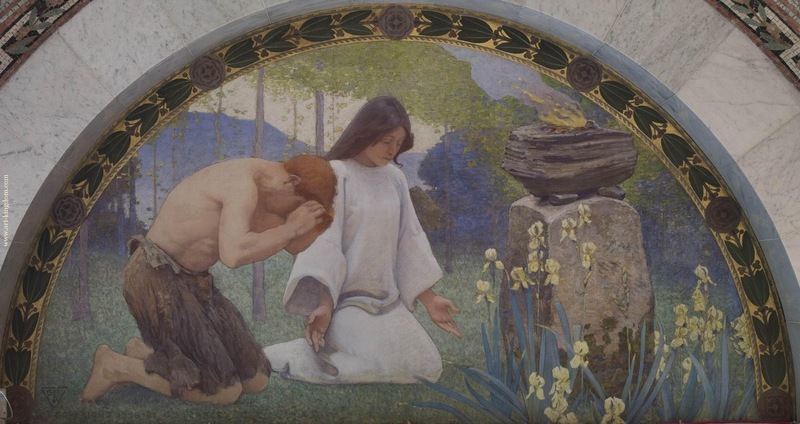 Pearce continued to exhibit biblical subjects at the Salons of 1879 (Le Sacrifice d’Abraham - The Sacrifice of Abraham) and 1881, receiving an honorable mention at the latter for Décollation de Saint Jean-Baptiste (Beheading of St. John the Baptist). 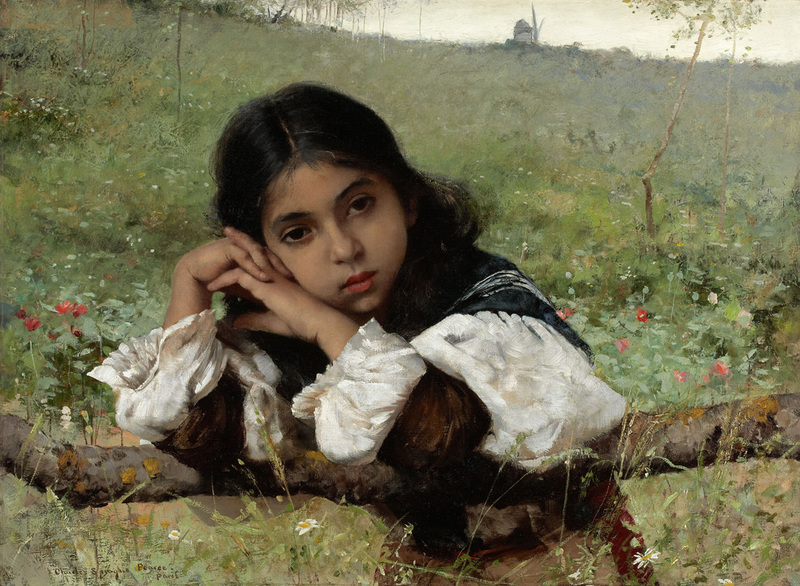 This work was later shown at the Academy of Fine Arts in Pennsylvania where it received a first-place honor and was later sold to the Art Institute of Chicago - the work was subsequently deaccessioned. 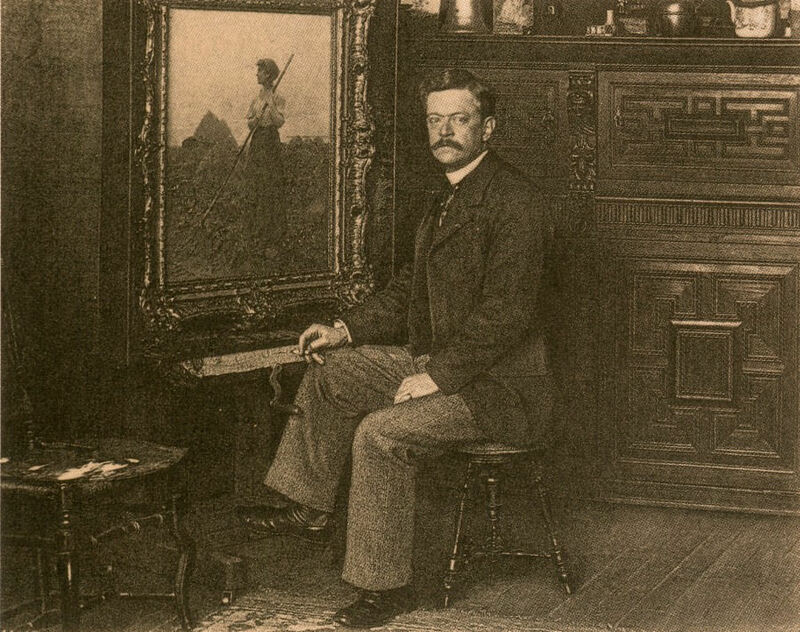 Pearce’s interest in Orientalism and the exotic directed his attention towards the current rage of Japonisme, the love of everything Japanese that was spearheaded by shops such as Siegfried Bing’s on the Rue Chauchat, Madame Desoye’s La Porte Chinoise, and publications such as Le Japon Artistique. 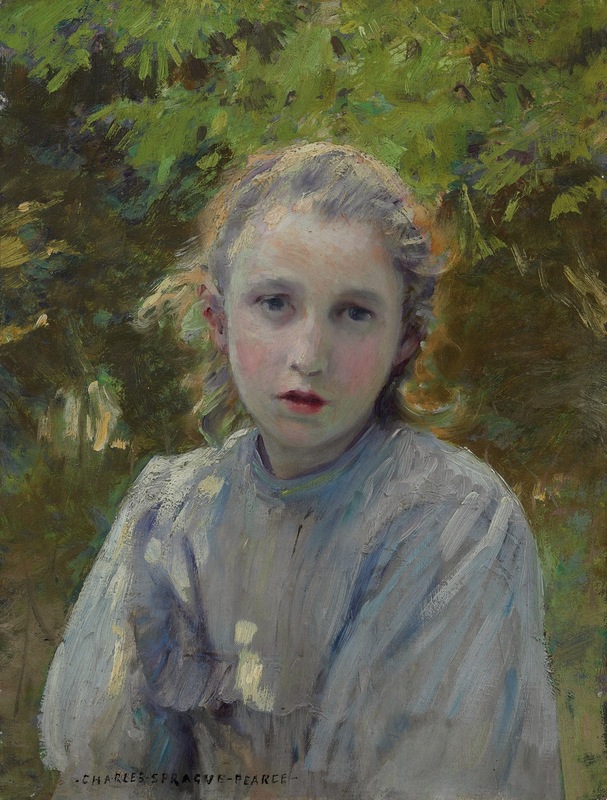 More and more artists, such as Edouard Manet, James MacNeill Whistler and Edgar Degas, began collecting “oriental” objects and challenging their use of spatial effects in order to simulate a kind of “japanesque” painting, replete with Japanese kimonos, fans, and porcelain in an often Europeanized setting. 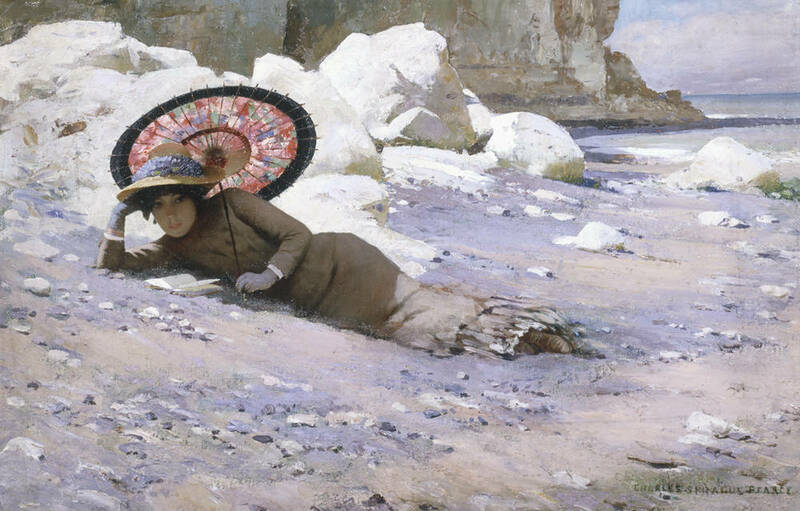 Femme à l’Éventail (Lady with a Fan) of 1883 is an appropriate example of Pearce’s integration of oriental objects, showing a European woman dressed in her kimono, holding a Japanese fan. 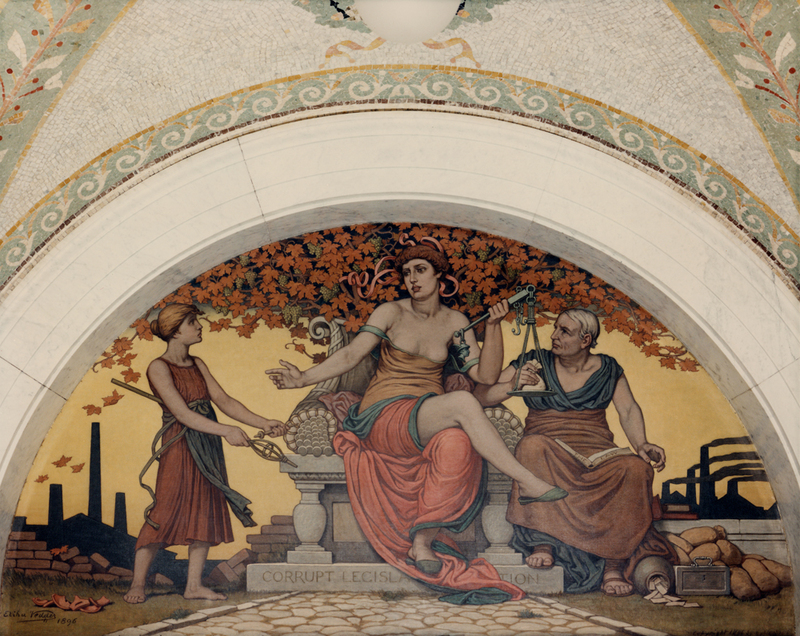 Furthering his allegiance to this interest, Pearce exhibited Fantaisie (Fantasie) at the Pennsylvania Academy of Fine Arts in Philadelphia. 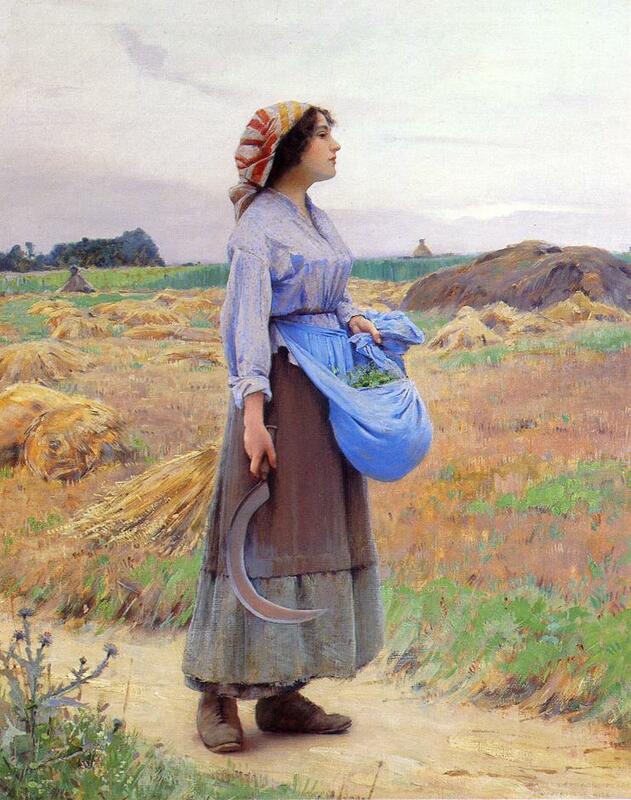 The work was highly praised and ‘attracted universal attention’. 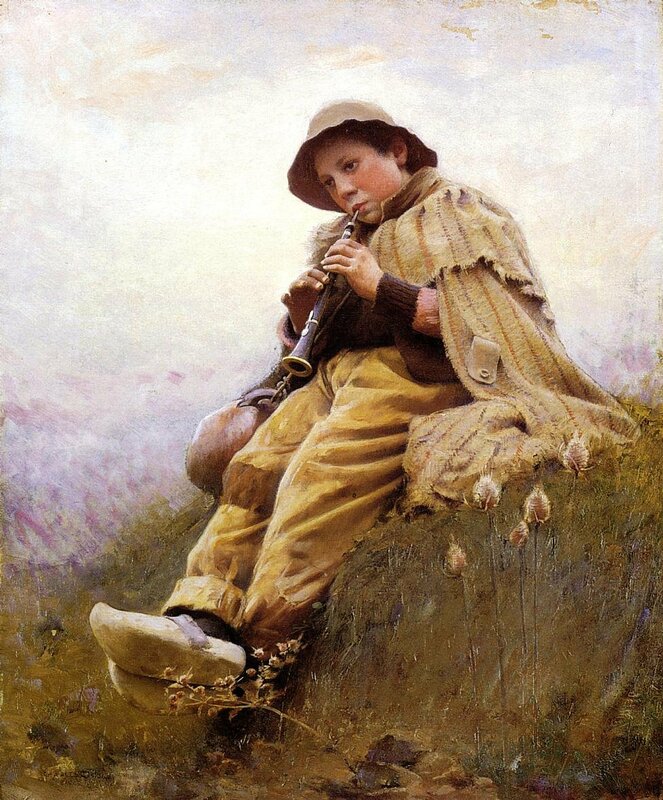 garnering him a third class medal, and marking a turning point in Pearce’s career and a heightening of his artistic powers” (Thompson, 684). 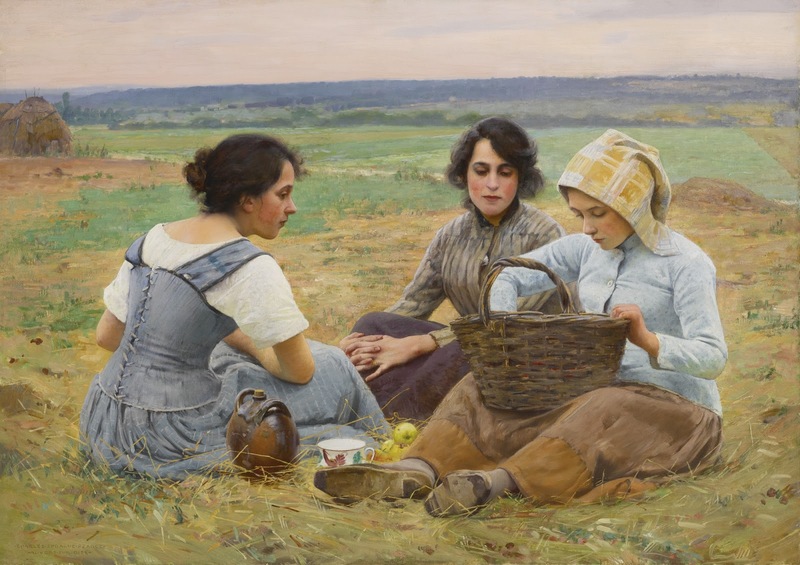 Nato da facoltosa famiglia bostoniana, Charles Sprague-Pearce (October 13, 1851 - May 18, 1914) ebbe modo di crescere in un ambiente molto stimolante dal punto di vista culturale e creativo. 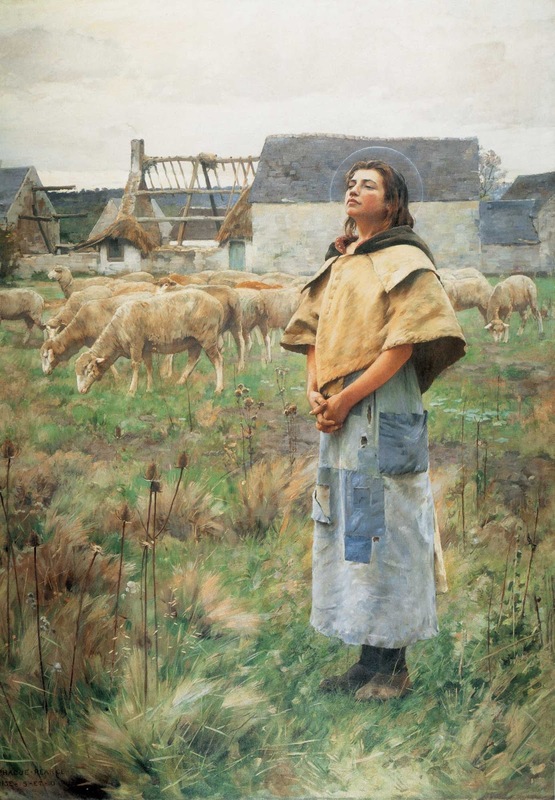 Suo padre era un mercante d'arte di successo specializzato in opere orientali, soprattutto cinesi, mentre il suo omonimo nonno, Charles Sprague, viene annoverato fra i poeti americani d'inizio '800 di una certa notorietà. 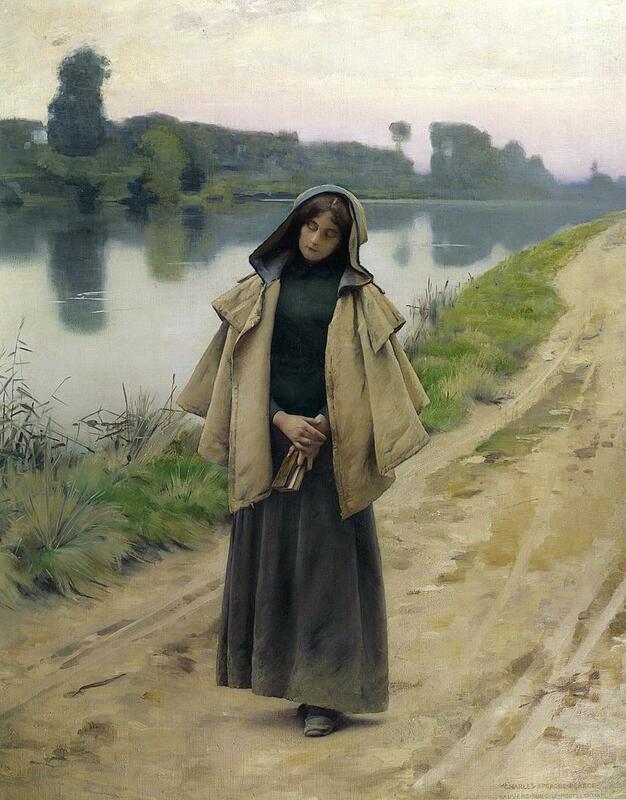 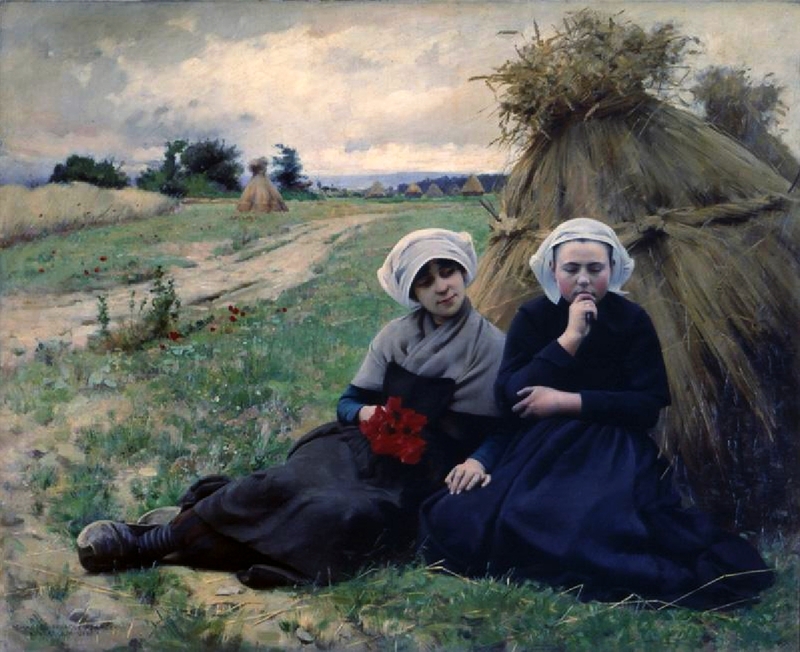 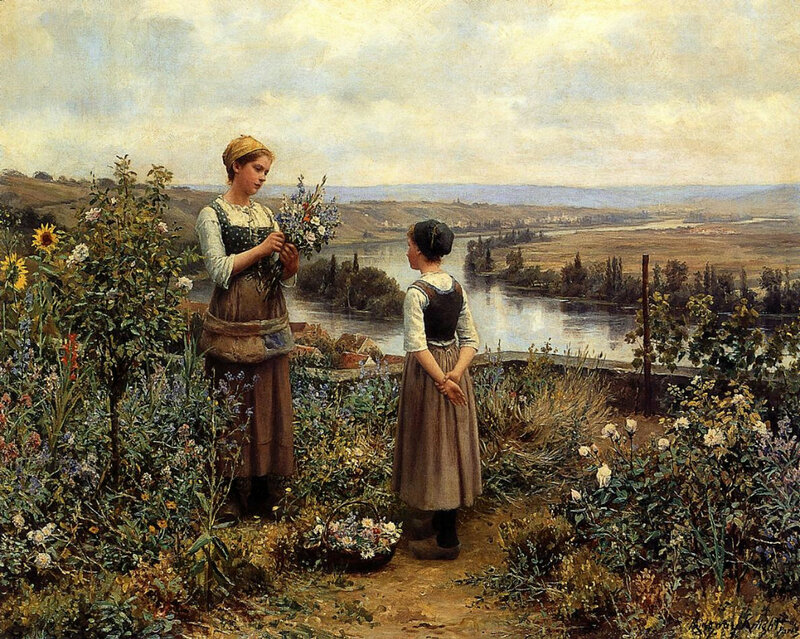 L'esperienza artistica di Charles Sprague Pearce si sviluppò prevalentemente in Francia, dove dal 1873 il pittore andò a vivere. 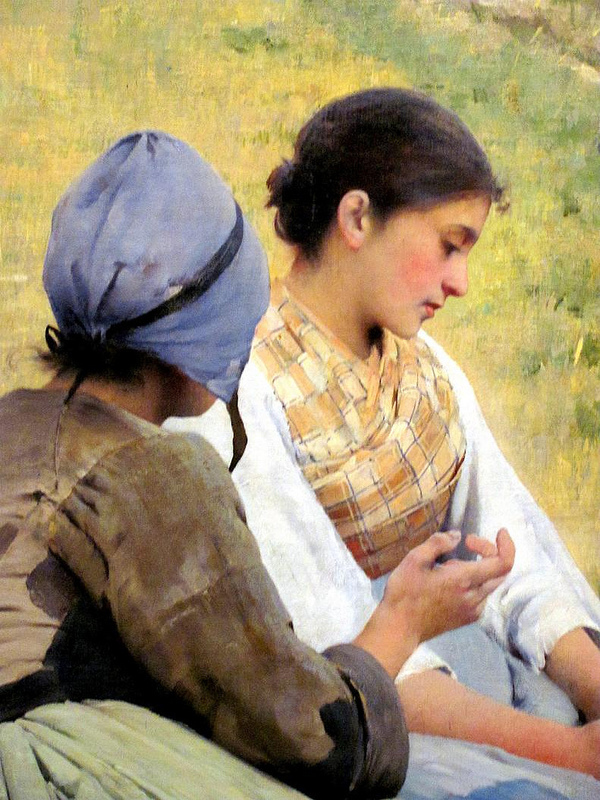 Vi sembra forse di avere già sentito questa storia da qualche parte? 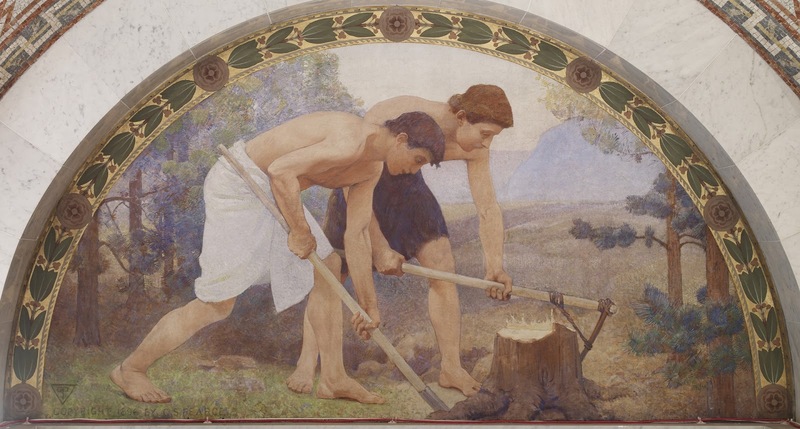 Non è un caso: molti fra gli artisti di fine '800, andavano a formarsi a Parigi, a quell'epoca fulcro dell'avanguardia creativa mondiale, se così possiamo dire. 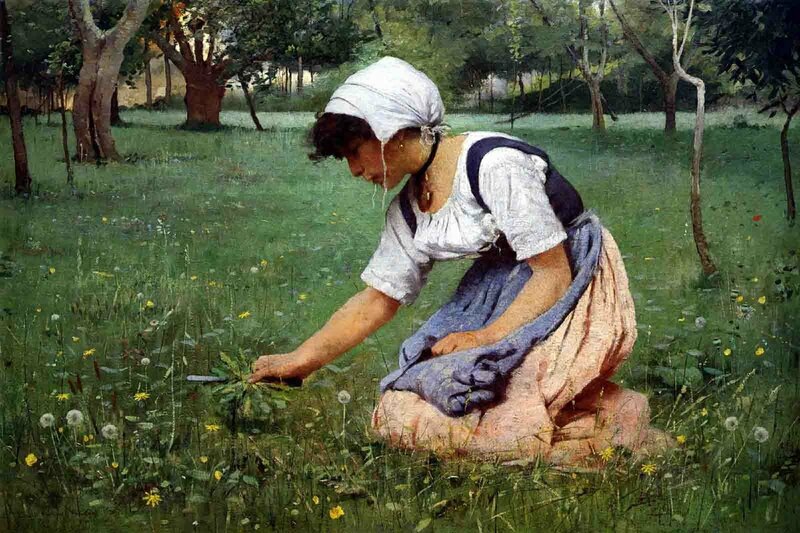 Nell'ateleir del maestro Léon Bonnat, Charles Sprague Pearce ricevette un'impostazione improntata allo spirito accademico. 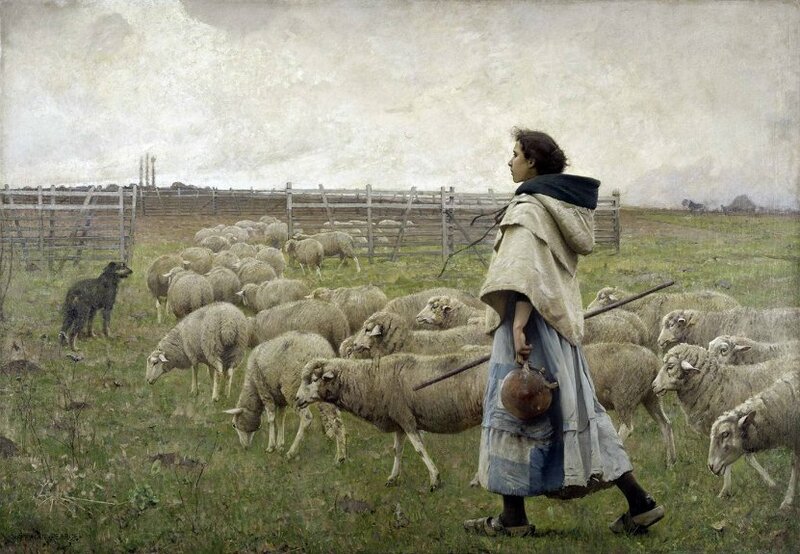 Sviluppò successivamente un personale interesse verso una certa tendenza esotica, molto in voga in quegli anni, alimentata anche da suoi viaggi e soggiorni in Egitto e in Algeria. 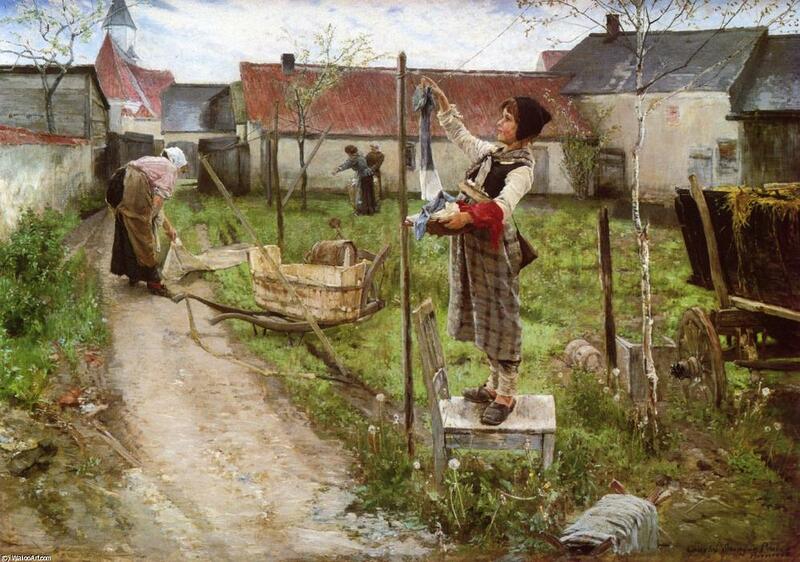 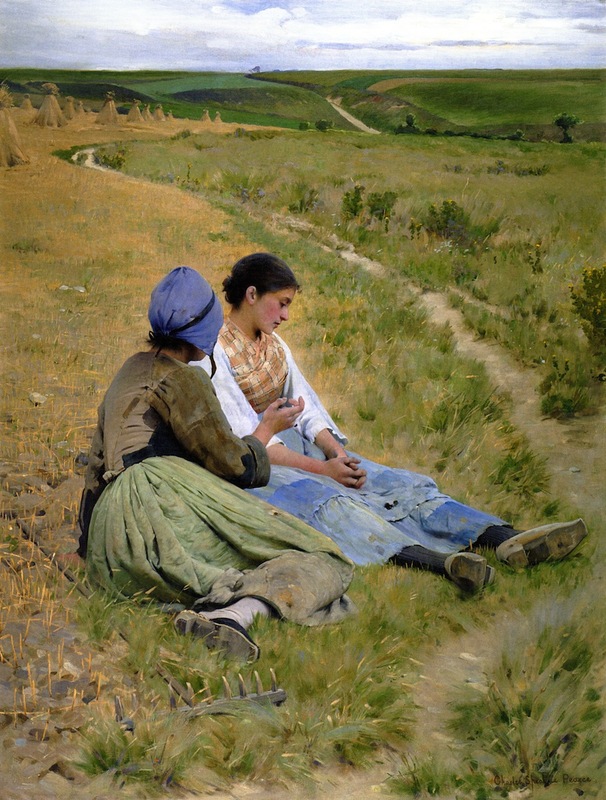 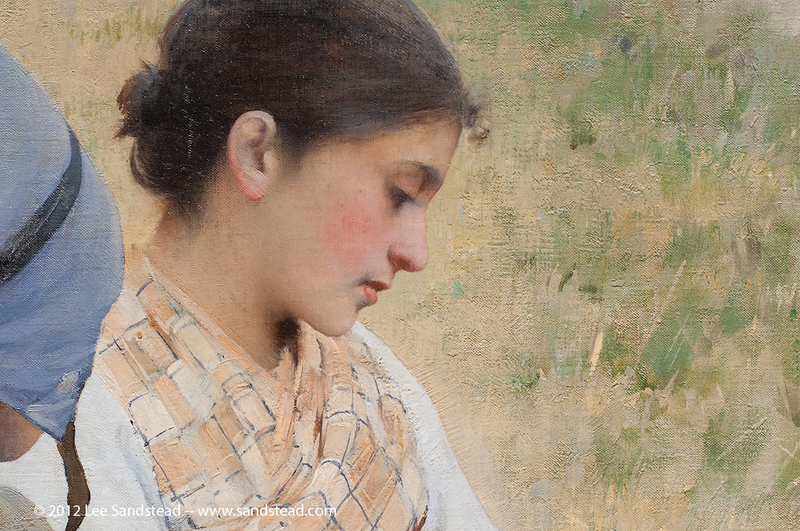 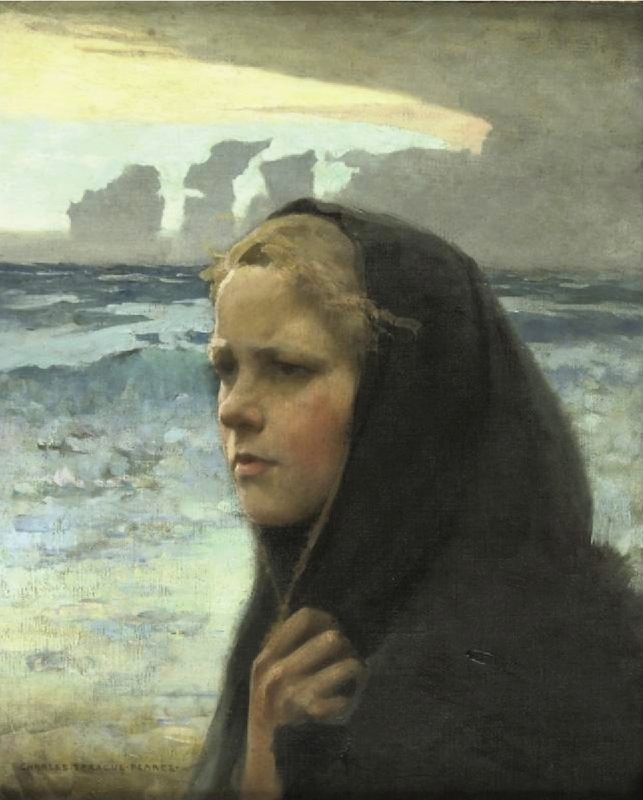 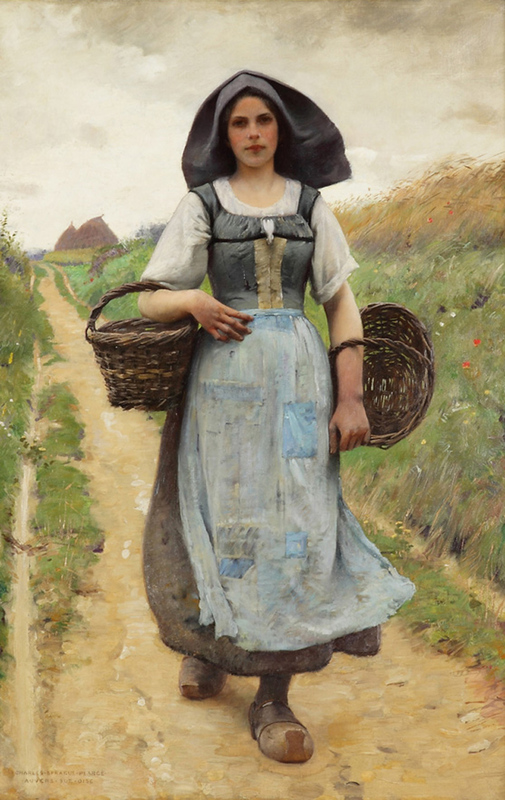 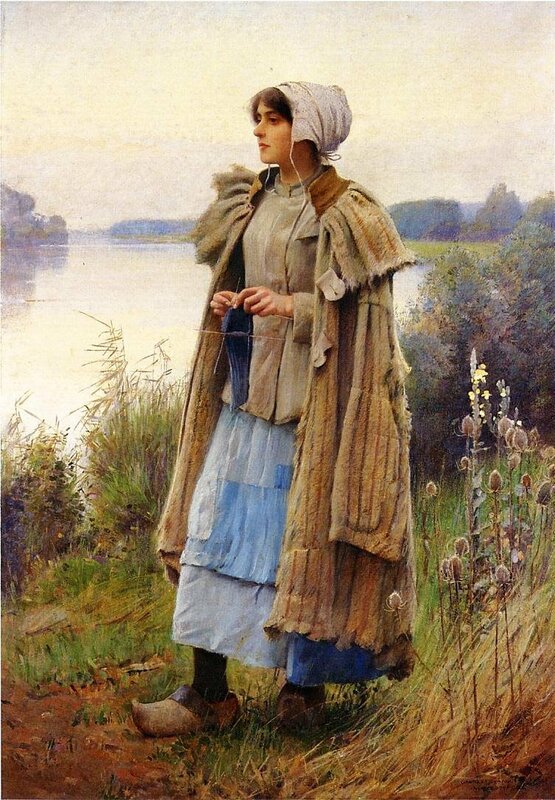 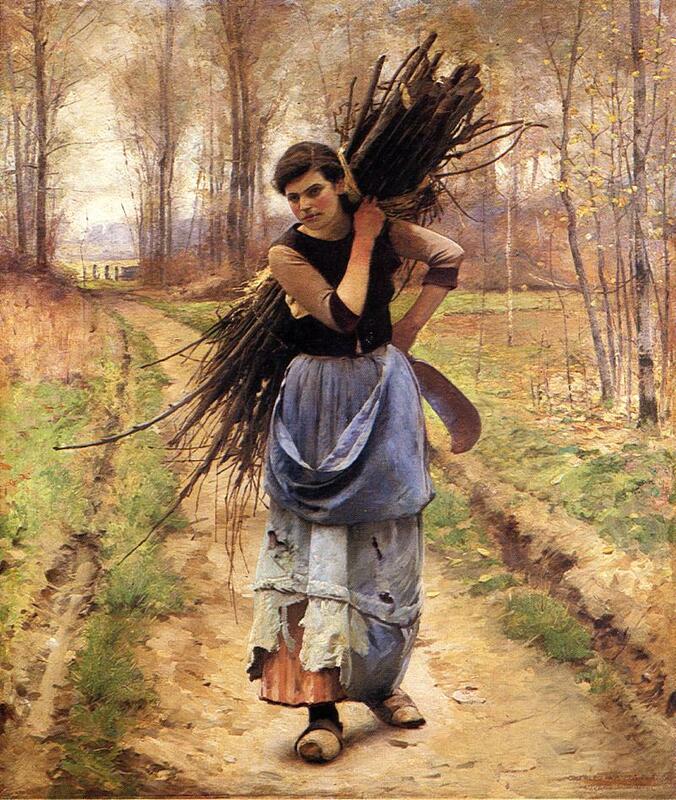 L'espressività di Charles Sprague Pearce, pur presentando aspetti d'impatto emotivo assai evidente, è pienamente allineata con la tradizione (qui, e poi ancora qui, potete ammirare due belle carrellate di sue opere). 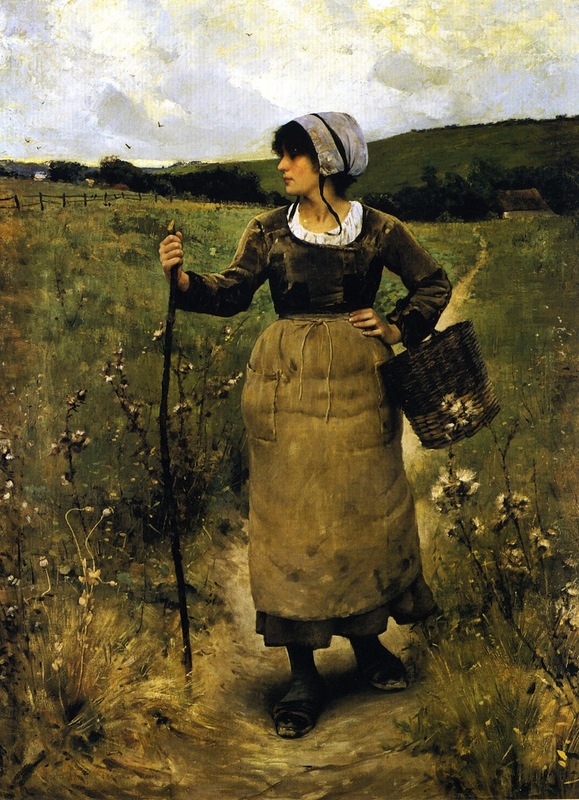 Nei suoi quadri si leggono chiaramente le influenze di Millet e Corot, per fare solamente due nomi eclatanti.